There have been untold artistic interpretations of Vincent Van Gogh’s work through the years, in every medium from cakes to canon-altering Dr. Who episodes. But perhaps the coolest tribute to Van Gogh doesn’t involve imitating his work, but changing the perspective on his paintings to tilt-shift. The images were created a few years ago by Serena Malyon, then a third-year art student, and posted at Artcyclopedia. Typically, tilt-shift photos are created with a special camera lens that makes real-world objects appear miniature, but the effect can also be created in Photoshop by playing with an image's contrast, color saturation, and depth of focus. According to the project page on Artcyclopedia, "It works quite well with regular photographs, so we decided to try it using paintings to see what would happen, and it turns out that the works of Vincent van Gogh in particular make excellent subjects for this kind of treatment." "Nothing in any of these paintings has been added or removed or had its proportions changed," the page continues. "The effect is achieved simply by manipulating the light in the scene and adjusting the areas of the image that are more and less in focus." As an artist who saw the world like no one else, Van Gogh might have enjoyed the shift in perspective. 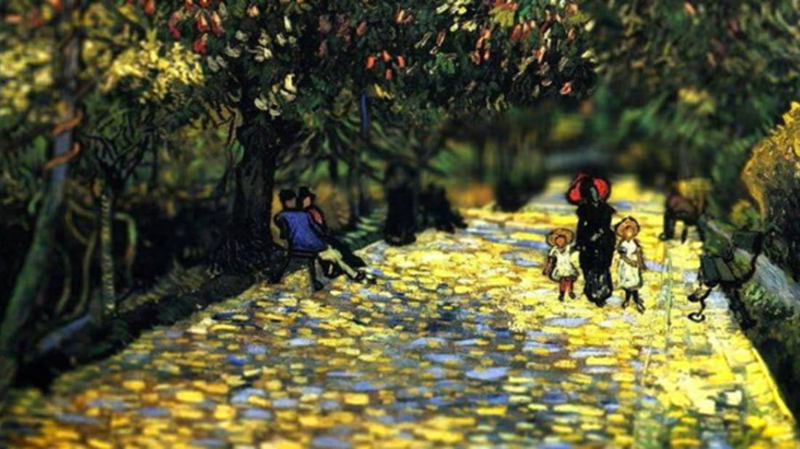 You can see more tilt-shift Van Gogh at Artcyclopedia.